IT'S MARCH 2001 AND TIME TO SAY 'GOODBYE PICCADILLY!' Yes, prepare for a shock the next time you go to Piccadilly, because the place you knew has gone. The sunken gardens, as celebrated in the paintings of LS Lowry and in innumerable postcards and photographs from the 1950' and 60's, have been consigned to history. The statues of Peel and Wellington are about to be moved. The ground is being levelled to form a large grassy space, and the foundations for a Japanese style concrete pavilion have already been laid. Should we be in mourning or celebrating a new beginning? See the background to the redevelopment in my Piccadilly 1999 update. In 1999, the planning committee of Manchester* City Council decided to implement a controversial and expensive redevelopment scheme for Piccadilly. The job was to be paid for by selling off land at the Portland St end of the gardens, on the left of this picture, and putting an office block on it. Eyewitness says: It's true that due to the local authority's neglect of the area, the gardens had become run down, however, on sunny days like this one, they remained a very pleasant location. Was it really necessary to consign Piccadilly as we knew it to history? 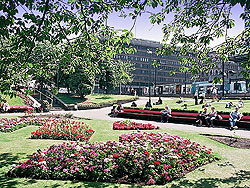 PICCADILLY GARDENS as we knew them have in March 2001 been consigned to our memories and old photographs (including mine). The foundations for a curved concrete Japanese style pavilion are being laid by construction workers. To the right we can see the magnificent facade of the Portland Thistle Hotel, converted from the palatial warehouse building designed in 1854 by Edward Walters. This facade will disappear behind an office block to be built at the far end of the site. Part of Piccadilly Gardens was sold off by cash-strapped Manchester* City Council in order to raise money for an expensive and controversial 'designer' makeover on the remainder of the Gardens. PICCADILLY GARDENS in February 2001 - The sunken gardens have gone. The Coronation fountain, put up in 1953, has been removed. To the left we see the interesting and varied facades overlooking Piccadilly, including the white building centre left which used to house the offices of the BBC. In front of it, we can just see the statue of Queen Victoria, the only statue which won't be removed under Manchester* City Council's plans. To the right is the Portland Thistle Hotel. PICCADILLY GARDENS is a place which contains many hidden clues to the Manchester of past times. This house once belonged to the Royal Infirmary which stood on this site until about 1908. In front of it is a stone wall which marks the old line of George St. The house and the wall next to it, which probably date from before the 19th century, are about to be removed, clearing a wide open space for Manchester* City Council's contemporary style replacement for the Piccadilly we knew. *It's important to remember that the City of Manchester* local authority covers only a comparatively small part of the area known in the wider world as 'Manchester', and is therefore unrepresentative of that area. Piccadilly is an important focal point in the Manchester area, so the local authority question is crucial. More about this in Manchester boundaries.